The full sequence of the banana genomic DNA was published last week, giving access to the sequences of all the 36000 genes in this important crop. 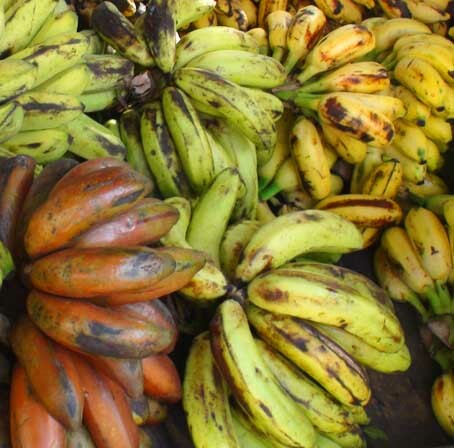 The publication of this information is of both applied importance, giving knowledge of the genes giving the agronomic and food-related properties, and of fundamental importance to research since it allows us to compare banana with the related grasses and palms to understand genome evolutionary processes. The international consortium was led by Angelique D’Hont and Patrick Wincker from the French CIRAD and CEA-Genoscope research organizations, within the framework of the Global Musa Genomics Consortium (and including many other researchers, along with Pat Heslop-Harrison from the Leicester, UK, Molecular cytogenetics research group, www.molcyt.com). All the information about the 520 million bases, and the publication in Nature, are freely available. Not surprisingly, given the huge advance represented, the publication has been reported in many papers. Press releases from the French agency for Agricultural Research for Development), CIRAD, issued the first press release , and release from the University of Leicester gave another perspective. Rosie Mestel from the Los Angeles Times (July 12, 2012, 2:52 p.m) published two important articles about the results from the project, “Did you hear? The genome of the banana has been sequenced, an important development in scientists’ efforts to produce better bananas. A look at that genome has revealed curious things, said Pat Heslop-Harrison, a plant geneticist at the University of Leicester in England who was a coauthor of the report published this week in the journal Nature.” Her second story discussed the implications of sequencing and the development of new, disease-resistant varieties which do not require many fungicide sprays. Hopefully the genome sequence will accelerate use of the diversity present in the germplasm pool of banana. Past experience suggests that press-related website addresses change quickly; hence the links above have been archived with webcite.com / webcitation (although the links do not seem to work with the Chrome browser). Thanks Anath. It is great that the sequence is now available, and there was so much of both fundamental and applied value coming from the analysis! Pat.